Our wedding shoots usually involve one camera operator and four or more High Definition (HD) cameras strategically placed to capture as much of your special day as possible. We can also come to you before the ceremony and film your preparations. Also, or alternatively, we can supply easy to use HD cameras for the Bridesmaids and Best Man so your preparations can be captured in a relaxed atmosphere in the company of relatives and friends. Enhance your business' Website with video which best shows off what you produce or the service you can provide. Sure-Shot HD Video Production offers a range of video styles from the simple illustrated interview based 'news' package to a full story board and scripted production. Andy at Sure-Shot HD Video Production will use his twenty years experience in mainstream media production to ensure your business looks its best. Sure-Shot HD Video Production can also document you event, party, family gathering, theatre production or performance using multiple cameras and professionally recorded sound. This is espescially useful if you are a band or theatre company wishing to show off your talents to perspective bookers. "Andy... We would just like to say a huge thanks for our wedding video. it is perfect and just what we were hoping for. I would recommend you 100% to anyone wanting their wedding recorded! Not only were you totally professional throughout but you also offer very competitive prices/packages!!! thanks so much you made our day a lasting memory. " 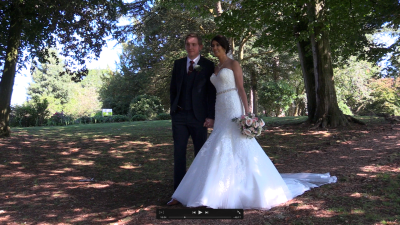 "Thank you so much to Andy for filming our wedding at the Manor House Hotel, Moreton In Marsh. Andy did such an amazing job using a number of different cameras to get different view points which has made the film very interesting. Andy was very professional on the day and did a fantastic job of capturing all the little moments that we will treasure forever. we can't recommend him highly enough!!" I was recommended Andy Barnard's Sure Shot HD video production service from my graphic designer, who plays in the same band. The music connection was immediately established! Having met with Andy and Clare Banks, both ex BBC, it was clear that these people were highly professional and knew exactly what they were talking about. This was extremely comforting as we had not embarked on filming project at the Bristol Show before and this was in effect their first assignment. Having given them the brief they delivered and then some! Needless to say that the Hi-Fi suppliers and Audio T were delighted with the end results. They were punctual (an early start was required), professional and the end product I think speaks volumes! Sure Shot managed the entire process from end to end, from filming to final editing and next year they will be handling the pre-production. I have no hesitation in recommending Sure Shot and will in all likelihood re-commission their services again for The Sound & Vision the Bristol Show for 2015.